10. For the Newly Adopted Pet – there is the Royal Canin DNA test. It not only helps you discover breeds that make up your dog, going all the way back to great grandparents, but it can also help identify mutations that could cause health issues in the future. Found at Lakeview Vet. 9. And speaking of grandparents, For Your Geriatric Pet – I recommend a new comfortable bed; there are several ones on the market that have extra cushion to help with arthritic joints or even a snazzy built-in heating pad. If your pet still loves to eat and destroy things in their old age, there is also a raised/hammock bed that keeps them cool and comfortable, but is indestructible. 6. For the Food Motivated Pet – there is the slow feeder bowl, which helps prevent inhaling their food and for cats a scavenger hunt, which helps let your cat’s natural instincts to “hunt” for their food thrive and relieves boredom as you hide their “food mice” all around the house. Don’t get me wrong I know several cats who love their meals served to them on a silver platter, but why not try something new this holiday season. 5. For the Couch Potato – I’d recommend prescription satiety diet to help lose weight without having to increase exercise cause let’s be honest, the only thing that usually gets them off the sofa is food, hahaha. Prescription satiety diet found at Lakeview Veterinary Hospital. 4. For our Adventurous Pets – a GPS tracker helps log not only where they are located at any given time but also logs their exercise and where they have been. Most GPS trackers require a yearly subscription so if that’s too much to commit to, I’d recommend a microchip. While it may not track your pet, at least if they escape they’ll have a better chance of being reunited with you. 3. 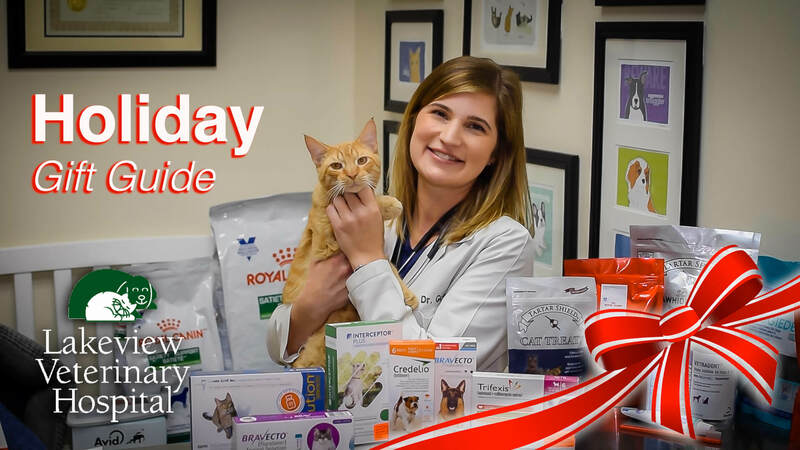 Every pet has teeth so this year consider getting your pets some dental care options like: dental bones, dental treats, water additive, Maxiguard mouth gel or good old fashioned tooth paste for brushing to help keep your pets mouth kissably fresh. Products sold at Lakeview Veterinary Hospital. 2. Our pets are exposed to all sorts of parasites like fleas, ticks, intestinal worms and heartworms. Purchasing a year supply of their monthly preventatives is usually the most cost effective way of protecting your pet from those nasty bugs all year round. Prescriptions sold at Lakeview Veterinary Hospital. 1. All pets can benefit from an annual preventative care exam. If detected early, 75% of common diseases in dogs and 63% in cats can be prevented changing their diet alone over a one year period. So bring your pet in and start the new year off with a happy and healthy pet.